After the e-IRG Open Workshop held in Sofia, Bulgaria, we had the opportunity to speak with Augusto Burgueño-Arjona, Head of the e-Infrastructures and Science Cloud Unit in DG Connect at the European Commission, for an update of the European Open Science Cloud's status. Augusto Burgueño-Arjona gave a presentation during the Vi-SEEM Workshop on e-Infrastructures at the Grand Hotel Sofia, co-located with the e-IRG Workshop. 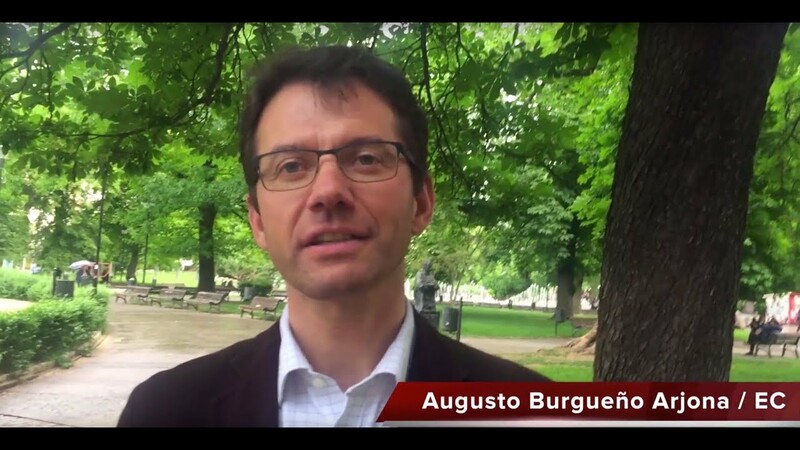 Augusto Burgueño-Arjona is responsible for the funding of the e-Infrastructure projects that are supposed to be the foundation of the European Open Science Cloud. The European Science Cloud is about connecting researchers and about data infrastructures. It is not about the data infrastructure itself, it is not about EuroHPC, for instance. No, EuroHPC is a different project. This is not about the deployment of new infrastructure. This is about making the existing infrastructure accessible to all European researchers. How many researchers are we talking about? In the slide of my presentation, I put 1,7 million researchers in Europe. The European Open Science Cloud vision is already there since a number of years. What is the status today? We have been using the concept of enabling access to existing infrastructures already for many years. In the past, we used to have initiatives focused on different technologies. For example, we used to have distributed computing and we had the EGI as an initiative or data infrastructures like EUDAT, or GÉANT for networking. That has always been our approach to enable access to existing infrastructures. The European Open Science Cloud concept was put forward two years ago and we have just recently published a staff working document where we explain what we have done so far and what will come in the next few years. The status of development is that we have one major project called EOSChub, which is a 30 million euro project with 100 participants. They are supposed to develop what we refer to in the staff working document as the federating core. They are going to develop all the enabling services that will allow researchers to access existing infrastructures and services. We also have OpenAIRE-Advance which is a 10 million euro project to cover the services that are required for the publishing part of research and the publishing of data as well. Another initiative is called FREYA. This is a project for persistent identifiers. There are also complementary activities like the Research Data Alliance that is supposed to facilitate the development of standards and recommendations for data sharing. There are other initiatives which are also important like the EOSCpilot. This is a project which is looking at different governance models and also contributing to the overall concept. Another project is eInfraCentral which is developing a catalogue of services that will be reused in the European Open Science Cloud. So, there are already a number of projects but if you look at the total amount of money, it is still quite modest, you could say. What are the total plans for the funding until the end of Horizon2020? It's difficult to pinpoint exactly how much money will be provided for this initiative because this initiative builds on existing e-Infrastructures. The projects that I mentioned are about 100 million euro if you include GÉANT. There is more budget coming in 2020 in the order of 80 million euro. The idea is to complement the funding that is already invested at Member State level for the actual deployment and maintenance of research infrastructures. Overall, when you look at the federating core and the federated entities which will be provided by Member States, regions and institutions, we are talking about hundreds of millions of euros, of course. It will be a federated infrastructure and you mentioned entities. What will be the entities that will be federated? I can think of all the research infrastructures that are already existing like for example ELIXIR. We expect that an infrastructure like ELIXIR will make available resources and services through the European Open Science Cloud, as well as the resources that are now being made available through infrastructures like EUDAT, EGI, and GÉANT. We also expect that the National Research and Education Networks (NRENS) will provide services to the European Open Science Cloud. So, there are indeed a large number of federated entities. So it is not about federating countries like, for instance, GÉANT does, that federates NRENS. It is about federating at a more complex level? It is about enabling access to services. The concept of federation reflects how the different allocations of responsibilities will be allocated. When you look at what we call the federating core, necessarily there must be somebody who provides identity and access management services, who takes care of security, who has accounting services to know how much resources have been used and so forth. We consider that the key element of the European Open Science Cloud is the provision of services and enabling access to those services. What will be the plans for the coming years? What will be the focal point? Still in the timeframe of Horizon2020, there will be another Call in 2020. The budget that we have, is about 80 million euro. At least, this was announced in the Draft Work Programme that we presented in the last Programme Committee. The idea is to continue supporting the development of the federation core and also to support service providers to cover the cost of access, the cost that they incur when new users access their services. In the Ninth Framework Programme, we will see.